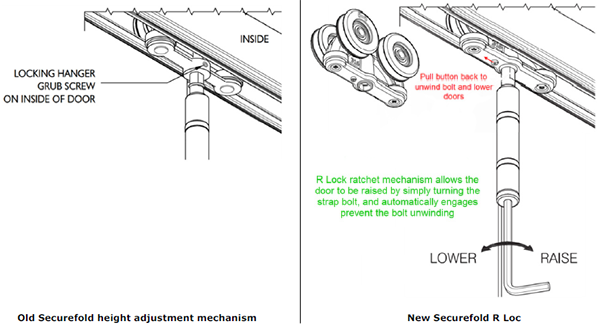 The new Securefold locking mechanism, R Loc, allows for ease of adjustment and speeds up the installation process. When fitting timber folding sliding doors, the R Loc system allows the installer to raise the doors by simply turning a strap bolt to wind the bolt up, and to lower these by pulling back on a small button on the bottom of the hanger or pivot block, thus releasing the R Loc and allowing the bolt to be unwound. Henderson’s R Loc has been developed in conjunction with extensive industry feedback resulting in a product that has enhanced Securefold 100kg as the definitive choice when specifying hardware for interior and exterior folding doors. 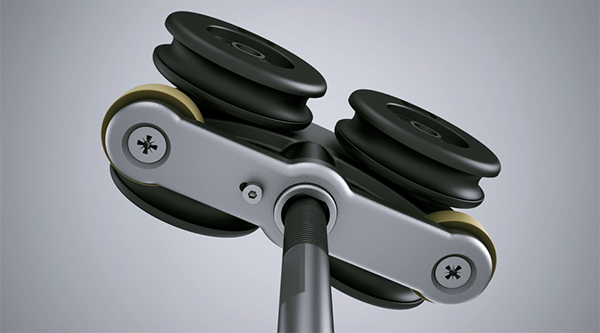 Engineered using high grade 316 stainless steel and cutting edge polymer technology, all components in the range have undergone extensive cyclic testing exceeding the maximum European BS EN 1527 grade of 100,000 cycles. The top-hung design creates a discreet, easy to operate system that avoids unsightly cut-outs. The change to R lock affects all Securefold 100kg pivot and hanger sets. Part codes will remain unchanged.